Art that moves me may not move you at all, and vice versa. I’m okay with that because we are all unique and have our own interests. Some works that I have viewed make me shake my head and wonder “What were they thinking?”. But doesn’t all this make life interesting? If we all liked the same stuff, how boring would that be? This image here has been edited by me. I want you to focus on that paper thing against the brown background. I have blurred everything else so that I can direct your eye…for the purpose of this post. I actually took this with my LG phone. Kat has asked us to look at those times when a piece of art or an image just turns us off or brings out a negative reaction. 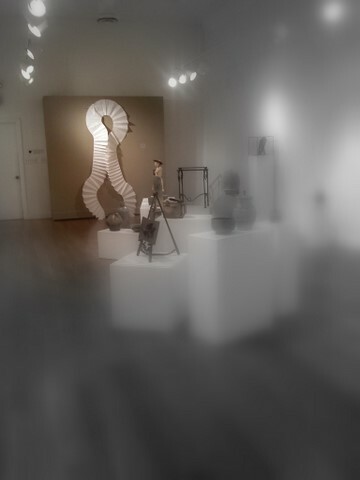 Last August we were in Art Space, our local art gallery that I really love. This display of different works was interesting and inspiring to me….except for…you guessed it…this paper thing. After looking at this and some images of other paper art that was in that same exhibit (that I actually liked) I have realized an important thing about myself. The images and art that speak to my soul tell a story. For me this folded paper had no story to it. You need to know that there were other art works there that were made of folded paper and were quite amazing. There was a series of folded cranes mounted on a blue paper as if it were the sky, and the cranes were in flight. That image stays with me. I totally love that a little goblin at a recent fall harvest party decided to dress the way she did. The sparkly skirt and the light blue tights just remind me that even little witches can get cold while out and about and collecting candy and treats. But to complete the ensemble let’s add in that pair of frog boots because you never know when it might rain. To me there is a story here. One filled with imagination and creativity and oh, so much fun. Someone else may look at it and have a negative reaction. I’m fine with that, because it is all so subjective anyway. Written for the Find Your Eye Course. Click on the image below to learn more about these fabulous online courses. Yes, yes, YES! I think you just wrote my post for me. And I love that little goblin, too. What a great outfit, and I love that you focused in on just her skirt, tights, and boots. That picture tells a story, for sure. Great job on explaining this reasoning. I love the way you write and find the perfect words. That little witch's skirt is adorable and just gets cuter with the tights/boots. There is a story for that one. Yes, it would be a rather boring world if we all liked the same things. I have been moved many times by your visual story-telling abilities and seek to find more of that in my own work. Today you made me smile with your little green-booted goblin. You understand the whys and wherefores of what speaks to you in the art of others and in the work that you create. Fabulous exploration of your reaction Deb! I love that you were able to put into words what is so important to you about what you create. Isn't that powerful? Funny how a little thing like what we don't like can be so helpful in finding our eye. Thank you so much for sharing your thoughts on this with us all. It's fascinating how in the simpliest of questions, we are learning so much about art, ourselves, and each other. You're very talented at capturing the stories in you images. I'm with Brenda, this little girl made me smile as soon as I saw her!